Altuve and Springer to be immortalized into ValleyCats bobbleheads! 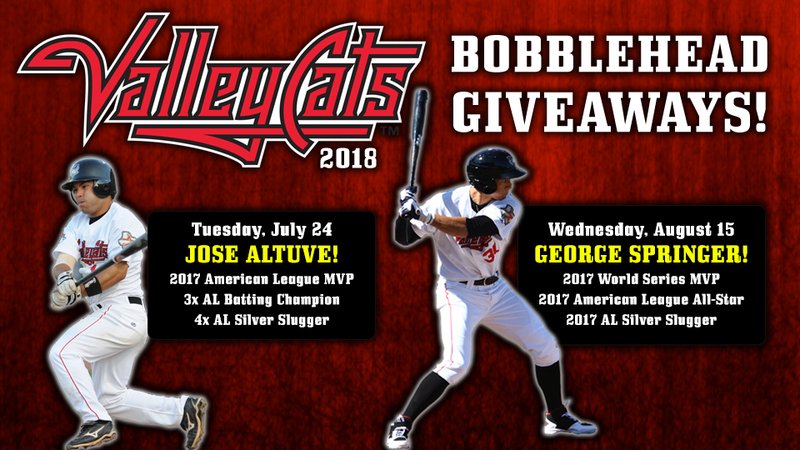 TROY, NY - The Tri-City ValleyCats have announced their MVP 2018 bobblehead giveaways, which will pay tribute to American League MVP Jose Altuve and World Series MVP George Springer. Altuve and Springer are both former ValleyCats that played in Troy in 2009 and 2011 respectively. Jose Altuve bobbleheads will be given away to the first 1,500 fans on Tuesday, July 24, while George Springer bobbleheads will be given away on Wednesday, August 15. Fans can guarantee themselves a bobblehead by purchasing its corresponding 2018 ValleyCats mini plan package. Each plan starts at $36 for six games. Full details can be found here. Altuve was named 2017 American League MVP after completing a season in which he captured his third AL batting title with a career high .346 batting average. He is a five-time All-Star, four-time Silver Slugger Award winner, and a gold glove second baseman. He was most recently named co-winner of Sports Illustrated's Sportsperson of the Year. In 2009, Altuve played in 21 games for the ValleyCats. Springer earned the 2017 World Series MVP Award after going 11-for-29 with three doubles, five home runs, and seven RBIs. He became just the third player in Major League history to hit five home runs in a single Fall Classic, joining the Yankees' Reggie Jackson in 1977 and Chase Utley in 2009. He set records for extra-base hits (eight) and total bases (29), and became the first player in World Series history to homer in four straight games within a single World Series. A first round draft pick of the Astros in 2011 (11th overall), Springer made his professional baseball debut with the ValleyCats on August 26, 2011. Altuve and Springer join the ValleyCats' exclusive Capital Region Baseball Heritage Series Bobblehead Collection that already includes Dallas Keuchel, Ron Guidry, Derek Jeter, Mariano Rivera, Bernie Williams and Johnny Evers. Ticket plans are available now by calling the ValleyCats box office at 518-629-CATS (2287) or e-mailing Jessica Guido at jessicakaszeta@tcvalleycats.com. 2018 fireworks dates will be announced next week, and the full promotional lineup will be revealed at the beginning of the new year.